Dates of birth and death unknown. Disciple of Tsutsui Kichijûrô I, he started his career in Kyôto during the second half of the 1700s. He performed as a wakashugata in the 11th lunar month of 1707 in Kyôto at Miyako Mandayû's theater in the kaomise drama "Sanmen Daikoku Zeni". He became wakaonnagata in the 1st lunar month of 1710, playing a hime role in the new year ni-no-kawari "Keisei Shijûhachi Taka". He performed for a few years in inaka shibai. Then, he became a disciple of Fujikawa Buzaemon I in Fall 1716. He received the name of Fujikawa Kinjûrô in the 11th lunar month of 1716, becoming tachiyaku and performing in the kaomise drama "Tatsu no Miyako Ikuyo no Yonedawara" which was produced by Yamatoyama Jinzaemon I. He appeared on stage for the last time in the 1st lunar month of 1719, playing in Kyôto the role of Genzaburô in the new year ni-no-kawari "Keisei Naniwadera". His rank in the 1719 Kyôto hyôbanki (3rd lunar month of 1719), tachiyaku section, was jô (superior) [visual]. No record afterwards. Dates of birth and death unknown. Disciple of Ichimura Uzaemon IX, he started his career in Edo where he performed under the name of Ikushima Koisa. He went to Kamigata, where he became a disciple of Fujikawa Sango and took the name of Fujikawa Koisa at the end of 1778 or the beginning of 1779. He performed as a wakaonnagata in the 11th lunar month of 1780 at the Naka no Shibai, playing the role of Princess Yaegaki in the kaomise drama "Mô Mô Yokaro Ushi no Tamamono", which was produced by Fujikawa Sango and welcomed back in Ôsaka the actor Yamashita Kinsaku II after 11 seasons spent in Edo. He performed at the beginning of 1884 in hama shibai at the Kadomaru no Shibai. He most likely went to Edo with his master in Fall 1784. 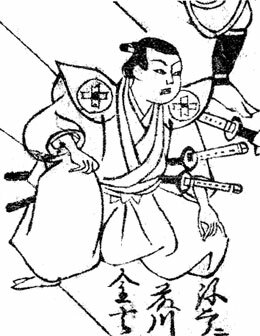 Fujikawa Sango died in Edo the 5th day of the 12th lunar month of 1784 . Koisa went back to Ôsaka where he was active in hama shibai up to the beginning of 1787. In Nojima Jusaburô's book "Kabuki Jinmei Jiten", the reading of the first name was Koizô, not Koisa. The 5th day of the 12th lunar month of the 4th year of the Tenmei era was the 15th of January 1785 in the western calendar.